Eleven years after the worst terrorist attacks in American history, a memorial honoring the victims is being dedicated at the Fire Training Center in Overland Park, KS. The memorial includes a 14 foot, 5,600 pound steel beam (pictured left) from the World Trade Center. 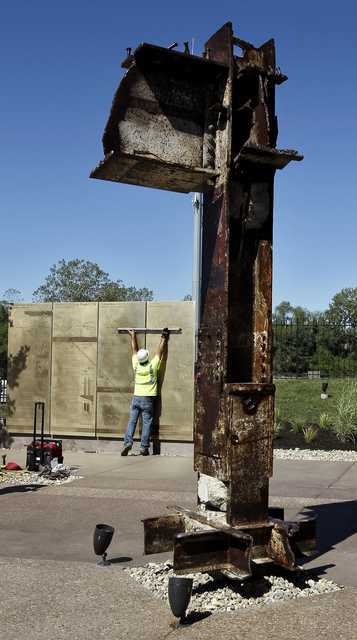 The beam has a hole near the upright tip that will cast a shadow on four panels marking each of the four planes that crashed on Sept. 11, 2001. At the exact time each plane hit, the shadow will be marked on the panels to forever remember those moments in history. This morning I remember those who died that day. I am thankful for those who have kept our nation safe from terrorists these past eleven years. I thank God for presidents, CIA analysts, TSA agents, front line soldiers and others who have kept us safe.